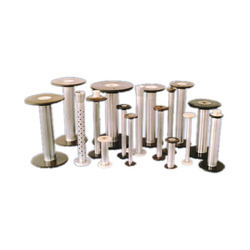 We are a leading Manufacturer of flanged bobbin from Gandhinagar, India. Esteemed as a dependable manufacturer, supplier and exporter, we offer the best quality of Flanged Bobbin. This flanged bobbin is precisely used in wrapping up the threads and coils in textile industry. Available with us in various designs and sizes, the offered flanged bobbin is manufactured as per the textile industry laid norms.